As I continue to read through the tremendous amount of information generated about Cisco ACI, one recurring theme is Cisco’s sensitivity to keeping customer acquisition and operating costs down. One little-talked about but poignant cost in data center deployments is that of cabling and transceivers for 10, 40, and 100 Gigabit Ethernet. Cabling and transceiver discussion when building a data center is about as exciting as building a house and talking about the plumbing. Sure, you need it. Yep, it’s gonna cost something. Can we move on now? Anyone who’s priced out data center plumbing, so to speak, knows that while not exciting, it can be quite expensive. Fiber optic cable comes in a variety of glass diameters and grades; 10GbE plus specifies OM3 or higher graded multimode fiber for short haul use – not cheap. Transceivers to send light across this fiber, especially when Cisco branded, are reassuringly expensive; the higher the bandwidth and the longer the distance required, the pricier the module. 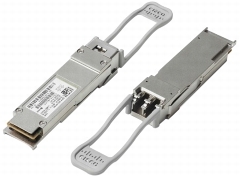 Enter Cisco’s QSFP 40Gbps Bidirectional Short Reach Transceiver, QSFP-40G-SR-BD. 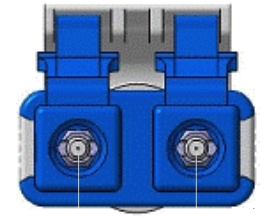 This module allows 40Gbps over a pair of 50 micron multimode fiber optic strands. OM2 grade cable is good for 30m; OM3 or OM4 grade is good for 100m. The benefit here is that 40Gbps is happening over a single pair of fibers using the common LC connector, instead of over twelve fibers using a MPO/MTP connector as required by the Cisco QSFP-40G-SR4, QSFP-40G-CSR4, and FET-40G. Most folks are already using single pairs with LC patch cables for their 10GbE links. Now, there’s a 40GbE replacement that doesn’t require a change to the cabling plant. Cisco is accomplishing 40GbE over a single pair of MMF using multiple 20Gbps light waves in each strand. The data sheet puts it like this. 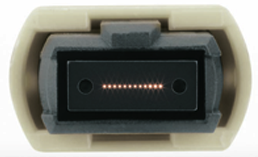 The Cisco QSFP 40-Gbps BiDi transceiver has two 20-Gbps channels, each transmitted and received simultaneously on two wavelengths when connected to a duplex MMF. The result is an aggregated 40-Gbps link over a duplex MMF. The end result is that Cisco is providing a 10GbE to 40GbE migration path for data center customers who’ve already made a rich investment in an OM3 cable plant. That’s a very big deal, and one that will potentially weigh on customer purchase decisions. Announced in the context of the Cisco Nexus 9000 switch line, the QSFP-40G-SR-BD will reportedly be available for other Nexus products as well. However, as of this writing, Cisco’s 40GbE compatibility matrix shows this transceiver only working with Nexus 9Ks running NX-OS 6.1(2)I1(1). Have you heard whether the BiDi optics are a Cisco innovation, or a standard?